One of the truisms of new media is that if you want your content to have an impact, you should keep it short. It’s a handy rule of thumb, but not an iron-clad rule. Tl;dr doesn’t always apply. Sometimes, in fact, longer is better. 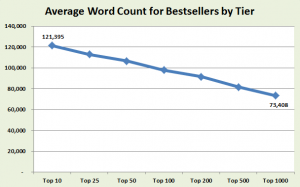 I doubt that readers actually seek out length per se—figuring that out for an e-book takes some effort. The key, rather, is that longer works tend more often than shorter ones to produce the kind of engagement that prompts readers to recommend them to others. What long books are good at is creating a flow of thought or, if you prefer, a world, that absorbs the reader into it. Length is not an impediment to this end, but (almost) a requirement. One of the defining characteristics of Twitter is its severe restriction on length, with a maximum of 140 characters per tweet. Though you might think its brevity is the key to its success, I don’t think that’s quite true. A single tweet generally won’t draw you in. It only does so to the extent that it is part of a flow of thought, whether that’s a collective Twitter stream or an individual’s ongoing tweets. The brevity of a tweet makes it accessible, but frequency of tweets is what builds engagement. The lesson to draw from this, I think, is not that longer is better. The important thing is focus on engagement. Don’t ask whether your content is too long or too short. Ask instead whether it’s connecting with the reader.